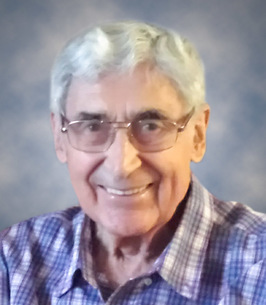 It is with great sadness that the family announces the passing of Russell Kuch at the age of 87 years. Russell is survived by his loving sons, Darrell (Kimberley) of Los Angeles and Kevin (Susan) of Calgary; grandchildren, Lindsay and Tristan Kuch; and sister, Elsie (Sam) Cherniak all of Calgary. Russell will also be fondly remembered by numerous nephews, nieces, relatives and friends throughout Canada. Predeceased by his wife, Lillian (nee Ponich) in 2017; and parents, Nellie and Frank. Prayer Service Friday, October 26 at 7:00 p.m. at St. Josaphat Ukrainian Catholic Cathedral 10825-97 Street, Edmonton. Divine Liturgy Saturday, October 27 at 10:00 a.m. St. Josaphat Ukrainian Catholic Cathedral with Very Reverend Mark Bayrock officiating. The family gratefully declines floral tributes and request that donations are made directly to the Alzheimer Society of Alberta & NWT, 10531 Kingsway Avenue, Edmonton, AB T5H 4K1.